According to PwC, 66% of companies say their leadership does not have a clear vision for the digital future. 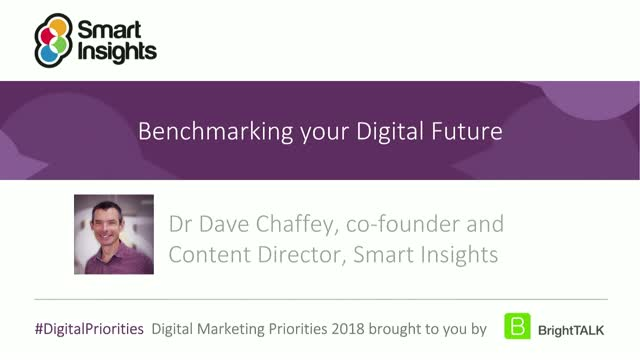 Our next free webinar hosted by digital strategist Dr Dave Chaffey, co-founder of Smart Insights, will explain techniques to help you review your digital capabilities, set your future direction and articulate strategy to colleagues. The webinar will include examples from a range of sectors including leaders from some generally less mature industries such as Manufacturing, Aerospace and Defence, Higher Education, Financial Services, Engineering and Construction. Join the Smart Insights team for an exclusive look around our Business Membership. Take a peek at the range of benefits available and how you can integrate membership into your team, whether you’re an Agency, Enterprise, Startup, Not-for-Profit or Consultancy. From learning how to plan, manage and optimize an integrated digital strategy or lead a digital transformation plan, Business Membership is designed to help and support your business goals that your whole marketing team understands whilst helping you grow your business above and beyond the competition. - How you can apply the RACE planning framework across your marketing with integrated communications. - How to use the Personalised Learning Plan and Capability Grader to plan short and medium term business improvements. - A look inside our business member content, including budgeting templates, marketing operations guides, and our RACE dashboard to help streamline your analytics. - The range of e-learning available to you, including our accredited RACE digital marketing strategy course. - How to use Quick Wins to supplement e-learning through a shorter, practical module. - Business Membership team dashboard to track and evaluate membership use. With a Smart Insights Agency Business Membership you can improve the digital marketing services your agency offers and grow your business. You will have full access to our specialist agency resources to review how you win, deliver and retain clients with ready-to-use templates and reports available for rebranding. Join the Smart Insights team for an exclusive look around our Business Membership platform and services. We will show how you can improve your agency marketing strategy by using and implementing a range of our step-by-step guides, templates, revenue calculators, pitching documents and reports. We will also take you inside our comprehensive e-learning platform, Quick Wins micro e-learning, and show you how you can plan, manage and optimize your organization’s goals to help create an integrated marketing strategy that is successful to your and your clients’ needs. Join Smartling’s Director of Global Marketing, Annette Obermeier, as she shares best practices to make your content work for you across borders and have your translation budget work overtime. Digital transformation has been around for a while now but what it takes to be successful at it continues to change at pace. Here we look at the latest trends and how businesses are implementing them in real-world examples. Join the Smart Insights team for an exclusive look around our Business Membership. Take a peek at the range of benefits available and how you can integrate membership into your team, whether you’re an Agency, Enterprise, Startup, Not-for-Profit or Consultancy. From learning how to plan, manage and optimize an integrated digital strategy or lead a digital transformation plan Business Membership is designed to help and support your business goals that your whole marketing team understands whilst helping you grow your business above and beyond the competition. What will be the tech advancements of 2019? And what will have the biggest impact on your email marketing strategy? We look beyond the smoke and mirrors to bring you the top strategies and tactics that savvy marketers should be focused on this year. “You’re either remarkable, or invisible"
In the past, your employer may have been one of the main drivers to help identify your skills gaps, investigate the training options available and push you to take different courses. This is still true to an extent, but with the fast-paced changes in the digital world and the widening variety of skills required to be an effective marketer, the responsibility is more on you to take ownership of your career development and personal learning journey. * Use Keyword Modifiers, the types of terms they use to find things online. Marketing will change forever on 25th May when GDPR takes full force - what will this mean for you? • What data is covered under GDPR and how can I be compliant on 25th May 2018? • What is the difference between consent and legitimate interest and what is the best for my business? • What rights will my customers have over how I process their data and for how long I can keep it for? • What impact will E-privacy have on what I have put into place to be GDPR compliant? What does your brand stand for? Being clear about your brand identity is important for businesses of all sizes. A brand’s identity is the cornerstone of its strategy. The brand is the face of a business expressed through its identity. This webinar will take you through the classical approach with practical examples that bring this logical, intuitive and creative process to life. The webinar will be presented by Debbie Inglis, owner of Brand Transformations, who has over 15 years experience of transforming brands strategically including Yeo Valley, Clarks, McCoy’s (UB), Appletiser (SABMiller) and Glutafin when owned by Danone. Did you know that only 1 in 7 of people worldwide are native English speakers, leaving six billion people worldwide who aren’t. This shows the potential of localizing marketing for audiences with different languages. But how do you achieve your potential? This practical webinar will explain a strategic approach with examples and actionable takeaways. Q1 is a challenging time for retailers worldwide, with revenue targets are at risk of being sabotaged by lower profit margins, high abandoned cart rates, and unsuccessful ad campaign strategies: are you equipped to conquer these challenges? Join the team at Nosto Solutions for a webinar on January 17th where they will discuss crucial roadblocks blocking your path to Q1 success - as outlined in the recently published Q1 Survival Guide - 2018 Edition. These findings come from Influence 2.0 research which focused on leading global brands that engage strategically in influencer marketing. After this webinar, you will understand the critical priorities and opportunities for marketers today in scaling influencer programs. In this webinar, you will learn the value of personalization to businesses. We show you how it can improve your customer's online experience by giving them an individualized journey resulting in improved satisfaction, increase loyalty and ultimately more profit to your business. Juliana will also share some case studies from a range of sectors and give examples of how these organizations improved their global content strategy. Research shows that marketers often overlook the importance of measuring your social media ROI. Even more so, they don’t use their analytics to inform their strategy and improve it. - How to use analytics to test your ideas and improve your results! Learn the latest developments and best practices to get better results from today's marketing and Ecommerce opportunities. Our channel, hosted by bestselling author Dr Dave Chaffey of SmartInsights.com focuses on actionable advice you can apply straightaway.